Hungry Dragon each game only last ~10 minutes, but you can play as many games as you want and the graphics are the same for the whole time. My point is, that not all games are equal, yes the the first two are very flashy, but for the amount of game play you get they are quite big. 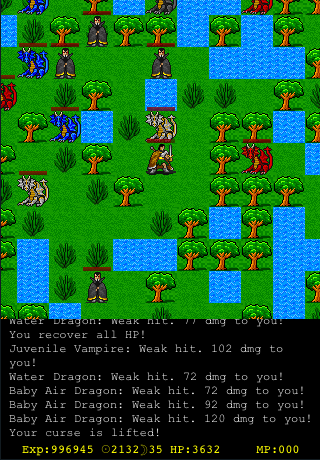 Hungry Dragon, really is a simple game, there’s not much to it, but it’s a fat little application, where as Undercroft Lite is a very polished and complete game, giving ~2 hours of game play. The full version is only 16.2 MB (42% bigger) and I’ve played for over 13 hours so far. Not sure if I have some moral insight, just pointing at the fatties, and call a spade a spade. email because I can store 1gig’s worth of stuff. I current have 440MB of 7414MB, so all this time I’ve never had more that 5% usage. Yes Google know lots about me, but it’s been useful. We have changed ISP three times in that period, and I’ve had three different work places, but one email the whole time. Well I’ve been busy over the last few weeks, searching the App Store for CRPG‘s. For me I’m looking for Role Playing Games on a Computer verses fantasy button masher version of Street Fighter, like Final Fantasy. Thus I’m looking things like: Bards Tale, Dungeon Master, Ultima, Ultima Underworld, Might and Magic, AD&D Gold Box games, Baldur’s Gate, but not dungeon crawls of the Rouge-like types. Now this was very early retro style game. First thoughts where the graphics were crazy old, but I read lots about the intention of the game, and it hits it’s design goals. Once you accept the graphic, you can get into the mechanics of the game, how combat works, the restrictions of one weapon and armor at a time, this all makes taking notes helpful to learn the system, while exploring an ever greater area of the game world. While I enjoyed exploring the game mechanics, I’ll be honest, I played till I reach the levelling limit of the free version, and then felt no need to buy the full version, it was fun, but it was not what I was looking for. There was very limited side quests. This is much more closer to the mark of what I was trying to find. 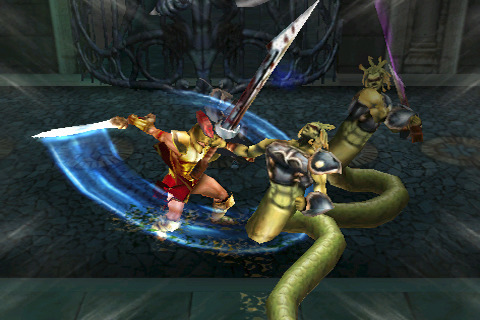 The game has a long history on PC and mobile devices, so this is really a port of the game to the iPhone platform. The game is very elaborate, and there is a lot that I enjoy, but a issue that grated for was the graphics. While they are claim to be buatiful hand draw pictures, and I assume they look good when seen at 100%, but they look really bad as they get scaled due to depth, movement. As the pictures are restricited to a 255 palette, they have the hard colour bands that come off really badly with the subpixel selection method they use, now if there where blended, and where more softened to being with I would have played more, but really it bugged me enough that I went looking for better. I was going to return if no better was found. This is a button masher, thus not what I’m looking for. It looks good, because it has too, it’s pretty lights and button mashing. This game is fantastic, very reminiscent of the class of game that I’m searching for. The game mechanics are great, you have a team of four people, but most importantly, it looks good. 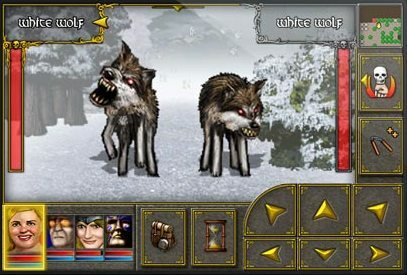 As you can see in the above picture, their is classic out of place look about the wolves to the back ground, but both look good, so it does not break the immersion (wonder if it’s pre-rendered or just good blending). It has multiple save games, and auto save. It’s turned based, so you have time to think, and plan your actions (no button mashing), but you can still do that by pressing the attack button as fast as you like, but you soon learn to slow done verse big monsters, to track health levels/damage etc. I like that they have a auto generate party otpion, this allowed me to start playing with pages of help explaining how the different stats/classes/skills effect things. Now that I’ve got the game understood, I’m keen to play again with a custom party. What I’ll be keen to explore at that point is how well the game replays, or weather it will be 100% replay.. So I have found the type of game I was looking for. In fact, Undercroft is very much what I was thinking I would like ‘my game’ to be, so my hats off to Rake in Grass for this classy game. They even have little humour points like the One-Ring to rule them all in the magic shop for only 999K. Update, 1 hour later: Just purchased the full game ($6.49 NZD) as I got to the end of the lite version. Very good price for a game that I’ve already spend a couple of hours playing.. I have removed the AdSense Advertising as it wasn’t doing much, slowed the page down a bit, and really was random if anybody clicked at all.